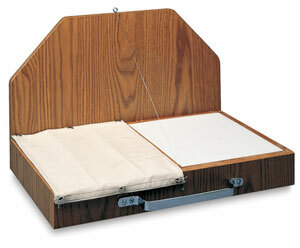 Amaco's Wedging Board has a sturdy wooden framework constructed of birch plywood with a polyurethane finish. Two recessed areas, 10" × 12" × 1-3/8" deep, are filled with absorbent plaster. The canvas wedging cloth snaps firmly over one area. A fine steel cutting wire is held taut by a turnbuckle. The Amaco Wedging Board measures 21-7/8"W × 14"L × 14"D.